On Saturday, May 19, 2012, more than 100 people attended the dedication of the “Lithuanians in Springfield” historical marker at Enos Park, Seventh and Enterprise in Springfield, Illinois. Sponsored by the Lithuanian-American Club of Central Illinois and the Illinois State Historical Society, the marker was paid for with donations ranging from $1,000 to $5 contributed by 20 individuals. Springfield Mayor Mike Houston talks about the importance of Lithuanians to Springfield. 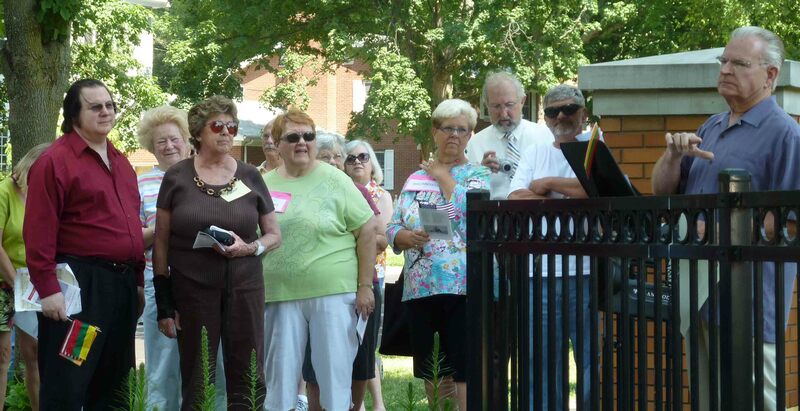 “Dedication today for St. Vincent de Paul Church marker,” State Journal-Register, May 19, 2012. “Commemorating Springfield’s Lithuanians,” Illinois Times, May 10, 2012. Read the text of the marker here. “A Time to Remember,” a piece written to honor Lithuanian immigrants, is reprinted here. See the program for the ceremony here. Click here to go to a photo gallery. Read a newsletter article by Congressman John Shimkus here.